As with the wilderness, it’s best to start at the bottom and work upwards, So: Dirt. But, wait, we already have dirt, don’t we? From way back in Part 2 - Paths in the Grass? Eh, we can do better. Dirt underground is often more heavily compacted, constantly damp and has a surface which is less even and more mud-like, particularly in a well trafficed dungeon. We need something darker and danker for underground dirt. Before you start, you should create a Photoshop document with all the same considerations and steps that we did before in Part 1 - On The Grid. You also need to give the map a unused buffer area around the outside, just as we did in Part 3 - Water Features. Once again, we'll be using a bevel effect that we don't actually want to be visible around the edge of our map. Once all that is in place, we can get started. Create a new layer and call it "Dirt". Pick two shades of a suitable groundy brown colour and make one your foreground colour and the other your background - it doesn't matter which is which. I chose #5e5351 and #4c4240 for my two shades. Then, go to the "Filter" menu, select "Render" and then "Clouds". An important point about Photoshop's clouds is that it creates a pattern that tiles under certain circumstances (which I will get to in a moment). This gives you a choice - you can either create a big map, just fill the entire thing with clouds and not worry about tiling; or you can create a seperate, smaller canvas to create a tileable dirt pattern on and tile the result over your main map when it's complete. Up to you. If you're not sure which to go with, 1024x1024 would be my choice here. The particular texture pattern used here is found under the "Patterns" group. Some other patterns may also work, so it's worth a try, but I like this one for the aforementioned, compacted, lumpy, damp dirt look. As this is going to be our bottom most layer, no more needs to be done here. Stay tuned for Part 14 - Flagging Efforts. Apart from some occassional niche cases, I feel I’ve covered everything a DM would want out in the wilderness in these tutorials. The next step is to delve into the ever-present dungeons. It actually makes a lot of sense to have done these first - dungeons are generally where most of the action happens in fantasy role-playing games. The problem - and the reason I focused on outside first - is that it is far easier to create chaotic, imprecise things like trees using Photoshop trickery than it is to create man made items the same way. There are, therefore, some things you may find in dungeons that I cannot help with. If you want a statue, for example, you’re just going to have to draw a statue. Many of these techniques have less refinement than the outdoors ones. Those I have tweaked over many years and occassionally replaced with newer, better ideas (particularly with the trees). I’ve done less work in dungeoneering and, in some cases, no work at all. Some of these tutorials I will be making up as I go, although as with the statue above, I can definitely see the shape of what needs to be done, even now. Part 13 - Staying Grounded. This one is going to be really quick. In Part 4, I recommended printing some trees out on overhead transparencies so that they can be scattered at will over maps. You can also do the same for blood splats and use them to mark the places where an enemy has died. If you're not of a sufficiently artistic bent to create your own convincing blood splats, there are lots of downloadable Photoshop brushes out there to help you out. Make sure you make lots, both big and small. If nothing else, the big ones are fun when someone is killed, shall we say, very thoroughly. Stay tuned for Part 12 - Dungeon Mastery. Sand is fairly quick and easy so this will be a short tutorial. Make a new layer and fill it with yellow. Don't make it too bright - a duller, muted yellow works better than canary colours. I chose #c9ab57. Next, go to the Filter menu and Add Noise. Make sure it's monochromatic and adjust the amount until it looks suitably sandy to you (I settled on about 12). Then add the following bevel and emboss effects (and note the pattern chosen in the second screenshot). Finally - I told you it'd be quick - apply a layer mask to the layer as usual. Because of the bevel effect, using a hard edged brush of any kind looks awful. For sand, use a round, soft edged brush, as large as you can for what you're drawing so you get the softest possible edge. You can also use a translucent brush to make the sand fade out more gradually on the edges. Unlike the rest of these tutorials, I'm not entirely happy with the sand. The texture bevel gives an approximation of sand dunes or herringbone waves while not really looking much like either of them. However, it serves most adequately and no one has complained yet. Our water layer - for drawing lakes, puddles, rivers and so on - is going to use a lot of layer styles, although we do need to start with a layer mask. Create a new layer and call it "Water". Fill it with a suitable watery colour. I use a nice, deep blue (#363847). Make a layer mask and lock the water layer. Delete everything on the layer mask so the map isn't flooded. Using a large, hard edged brush, draw a river from the left hand side of the map to the right - just so we can see what's happening as we continue. Our first task is to create a river bank - a sloping effect on the dirt around the water. For this, we can use a layer style. Click on the water layer - not the layer mask. Go to the "Layer" menu, then "Layer styles" and finally "Bevel & Emboss". Set it up as pictured below. This creates a gently sloping riverbank around the water. However, for extra realism, we can also have the bank cast a slight shadow on the water. Go to the "Layer" menu, then "Layer styles" and finally "Inner shadow". Your river should now look something like this. Next we need to create the appearance of shallow water near the edge, gradually getting deeper. For this, we can use an inner glow. Go to the "Layer" menu, then "Layer styles" and finally "Inner glow". The inner glow works fine and it's an effect I really like, but because the edge of the map is also the edge of the river, we get solid, straight bars of inner glow on either end of the map. This is one of the quirks of using Photoshop for this sort of thing and it's an effect which will pop up for a few of the terrain layers we will be creating. However, it's fairly easy to deal with. We need to make the edge of the map different to the edge of the canvas. Make sure your background colour is white. Go to the "Image" menu and select "Canvas size". Increase the width and height by two inches (an inch on each side). Unlock and then select the water layer (not the layer mask for the layer). Fill the gap around the edge with the same blue you used for the rest of the water. Re-lock the water layer and select the water layer's mask. Fill the gap around the edge in black. This will also wipe out your river but that's okay for the moment. Redraw your river on the water's layer mask but, this time, go past the edge of the map and right out to the edge of the canvas. It should look a bit like this, although I added a border around the image to make the canvass edges clear. This works, sort of. The white bars of the inner glow are now off the edge of the map. However, we can tidy up a bit more. Select the contents of the grass layer. On the Mac, hold down the command key and click on the grass layer's thumbnail. On a Windows computer, hold down control instead. Go to the "Select" menu and pick "Inverse". Create a new layer right at the top of your layer stack and call it "Border". Use the paint bucket tool to fill the selected area in white. 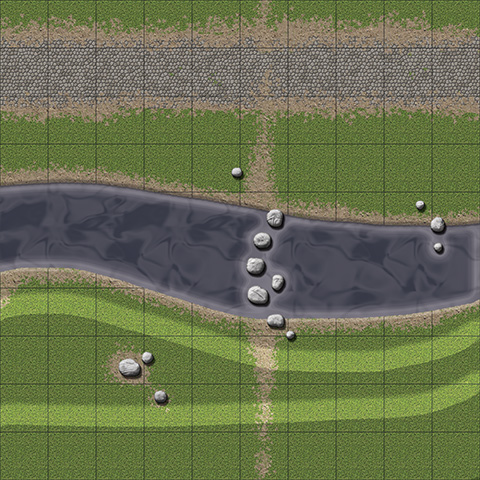 This has been a lot of work to produce a simple river and it looks fine as is, but there is just one more effect I like to add. Go to the "Layer" menu, then "Layer styles" and finally "Pattern Overlay". Photoshop has a lot of patterns to mess around with here but they're hard to find. You need to click on the arrow next to the pattern thumbnail, then the tiny little cog, and then you can select from a set of pattern collections. The one you want is at the end of the second row in the "Patterns" collection. Your final river should look something like this. When drawing water, use a hard edged round brush and remember that, if the water goes off the edge of the map, you need to continue the water under the white border to prevent that white bar effect. The banks of the water body should be dirt since grass just looks odd. If you do have a grass landscape, clear the banks with the maple leaf brush to create the raggedy, organic effect. Depending on the environment, you can also tweak the water colour - brown for a swamp, turquoise for a tropical sea and although I've not needed it myself, I suspect you can create a reasonable lava effect too (you might want to add a orange outer glow layer effect, though). Finally, if your computer is struggling, some of the water effects can be switched off without too much problem. The shadow, for example, is a subtle effect which doesn't impact the overall look that much.